This year’s finale of My Kitchen Rules has finished the way it ran for much of the season – controversially. Last night (you can read the viewer numbers here) saw Gold Coast couple Alex and Emily (main photo) win the final cook-off to take the $250,000 prize purse. 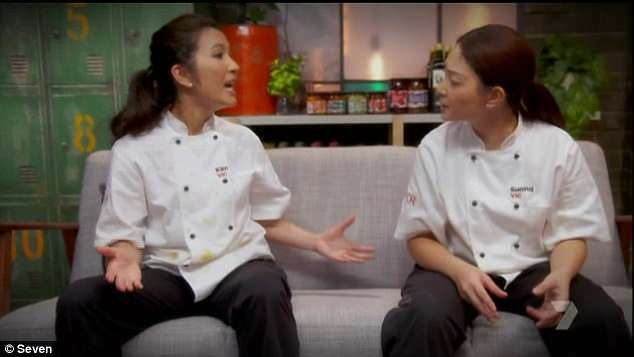 In doing so, relegating viewer favourites, Melbourne mothers Kim Tran and Suong Pham (below), into second spot. However, Alex and Emily’s win hasn’t gone down with everyone amid claims Kim and Suong “were robbed” out of the winner’s cash. Seven has not offered any comment on the claims. The winning score was 55 out of 60, while Kim and Suong managed 52 points. The cause of the anger was a lobster dish that was derided as dry, flavourless and “jarring” by judges Peter and Manu, but was given a perfect “10” by part-time judge, Liz Egan. Fans of the show quickly took to Twitter to highlight the apparent injustice and suggest Kim and Suong had been hard done by. Others described the result as “pure disappointment” and went so far as to call Alex and Emily the “least deserving winners of MKR ever”. Not that Kim and Suong escaped the criticism either with viewers saying the duo’s drama and theatrics had distracted from the actual food. “I love cooking shows, but I think this will be my final season of #MKR. Too much focus on the drama #mkr2018,” wrote one. With another adding: “Only watching MKR during the breaks of (Nine’s) The Voice. MKR has lost its spice.” Until next year, food fans!